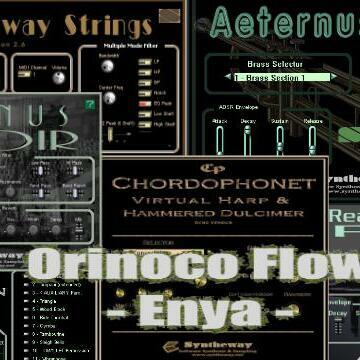 "Orinoco Flow", also known as "Orinoco Flow (Sail Away)" on some releases, is a 1988 song written and recorded by Irish singer Enya for her second studio album, Watermark. 2.- Aeternus is a Virtual Brass instrument, featuring solo Trumpet, Cornet, Trombone, Tuba, French Horn, Flugelhorn as well as Brass Sections and Orchestral Ensemble. 5.- Syntheway Percussion Kit VSTi: Is a collection of percussion instruments designed for creating Orchestral Percussion, Auxiliary Percussion, Mallet Percussion, Latin Percussion, Indian Percussion and African Percussion.